It can be a challenge to grow vegetables in hanging baskets in the open air because they dry out so quickly. 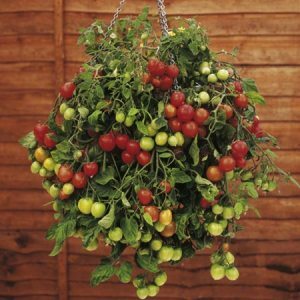 If you’ve heard that the popular hanging tomato planters usually yield substandard crops, that’s why. Let the soil dry out for a short period and your tomatoes are toast! Growing vegetables and fruits in hanging baskets in your greenhouse is another story. Because of the humidity in your greenhouse, your hanging baskets will stay moist and your yield will be impressive! Just be sure to keep the soil moist and fertilized. Here are some great ideas for your spring and summer baskets. Remember that a good rule of thumb is that root systems of most plants are about the same size as the plant itself. It’s important to only use smaller varieties for hanging baskets if you want them to do well. A Salad Basket: Plant a cherry or pear tomato plant in the center and surround with several varieties of lettuce, baby cucumber, parsley and chives. You could even add an edible flower or two – pansies or nasturtium. An Italian Basket: Definitely a tomato in the center. What would be Italian without the tomato? Surround with Italian parsley, lettuce, baby eggplant, cucumber and basil. Mexican Basket: Once again the tomato but this time surround with cilantro, Jalapeno peppers, lettuce, chives, and cucumber (salad bush is a good variety for this). Asian Basket: Try a Tumbler tomato with basil, snow peas, ‘lemon’ cucumber, cilantro and ‘Brunia” lettuce. How about just planting lettuce in a hanging basket? Here are a couple of good ideas for tasty and beautiful baskets. First, fill the basket with a light potting soil. Place leaf lettuce transplants about 4 inches apart in holes through the basket. Push the root ball through the moss into the moist soil. Be sure to place several transplants in the top of the basket, too. Once they lettuce grows, you will have an almost completely round basket. Try to alternate a green-leaf lettuce like Black Seeded Simpson with a red leaf like Red Sails. That will make a beautiful basket. Or combine red sails, salad bowl and green ice. You could even mix in a few pansies, voilas or red chard just to make it even prettier. Send me some pictures of your baskets or, do you have any other ideas? This is a great place to share them.